At least he’s got tunes to distract him from certain death. 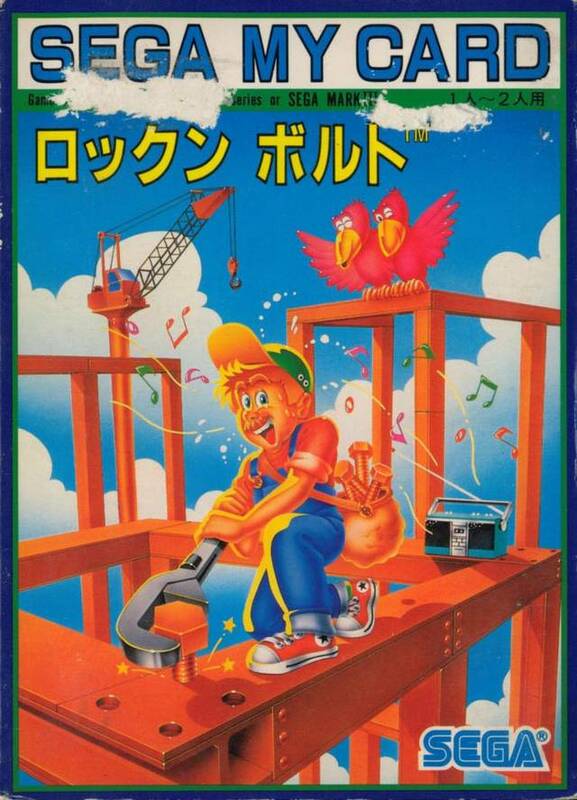 Were construction worker-themed puzzle games all the jam back in the mid-80s? Nintendo had Wrecking Crew, and Activision had Rock N’ Bolt. Now, two games might not sound like a lot, even for a sub-sub-genre of gaming (perhaps there were more, these are the only two I’m aware of). But can anyone truthfully say they expected hard-hat wearing, cortex-wringing action in a video game at any time, let alone two separate games released within a year of each other (Wrecking Crew burst onto the Famicom in June of ’85, while Sega ported Rock n’ Bolt to the SG-1000 sometime the same year)? Wrecking Crew‘s bizarre personality – Eggplant Men! Robotic Foreman! Walking Wrenches – makes it the better of the two games, but Rock n’ Bolt‘s quiet charm isn’t to be denied. You play as a generic construction worker and your job is to bolt down moving platforms within a certain time limit. 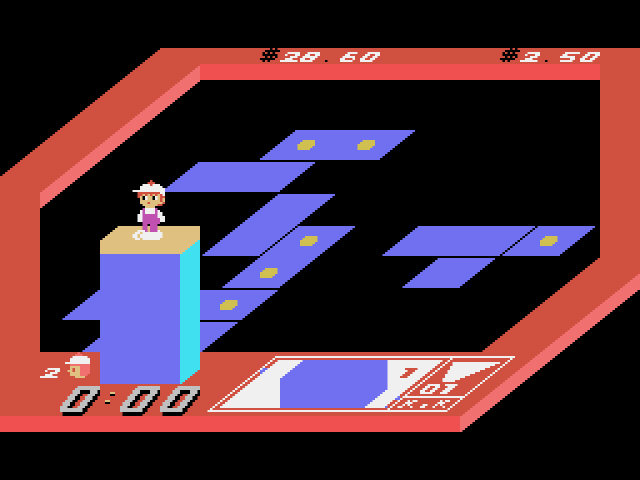 All the platforms move in set patterns at different speeds. To reach platforms on the far end of the level, you’ll often need to ride a platform to the back end of the “job site,” bolt the platforms down at an appropriate location (one where you’re not stuck out in the middle of black space), then move forwards back to the starting point. In other words, it’s almost always better for you to bolt backwards to forwards. If you do happen to bolt a platform in the wrong location, unscrew the bolt and the platform will begin to move again. “Tom Sawyer” plays softly in the background. In the odd-numbered levels – 1, 3, 5, 7, etc. – you can bolt the platforms in any direction you desire, as long as you’re able to get back to the level’s starting point. 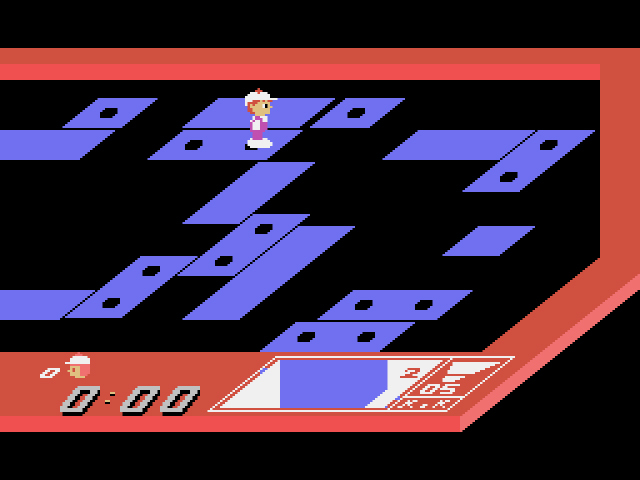 In the even-numbered levels – 2, 4, 6, 8 – however, you’re given a map on the bottom right hand corner of the screen that shows you specific areas where the platforms need to be bolted down. Failure to bolt the platforms in the location indicated on the map will result in red screws instead of yellow screws (red means bad, yellow means hooray). It takes a special kind of man to bolt all these down in a timely manner. I made it to level seven before I grew overwhelmed with the amount of moving platforms and the lack of time with which to bolt them (kudos, though, to the SG-1000 for handling a plethora of objects moving in all directions). Because the time limit is so short – usually no more than a minute and thirty seconds, depending on the size of the level – later levels need to have perfect runthroughs in order to be completed. If you want to see how far you can get without any pressure, pick the Free Play mode. In Free Play, the burden of time no longer eats away at you; as if you exist in some Communist fairyland where time is infinite and work is done for work’s sake, not for a paycheck. Of course, playing without a time limit nullifies the challenge of the game, but it makes for good practice. Rock n’ Bolt isn’t a classic, but at times it locks you into a meditative groove that’s all its own. Few SG-1000 games can say as much. Hey the SG-1000 is starting to rock! C’mon you two must be warming to it now. It’s been a good run of solid B grade games. This game looks pretty cool.ni can’t remember seeing anything like it before. So Axtivision released this other places as well? In the arcade, as well as for C64, ColecoVision and MSX. I have a feeling the game came and went with little fanfare. Frankly, I’m surprised it has a Wikipedia page. So, Luigi just left behind a wife and son when he followed Mario to the Mushroom Kingdom? And the attempts to pair Luigi off with Daisy means that Daisy is a homewrecker? No wonder Nintendo shoves Luigi out of the limelight so much.